The lovely Diann at The Thrifty Grove sent me a sweet email letting me know she was featuring my "Sanford and Son Wanna Be" on this week's Thrifty Things Friday. I am so honored to be featured this way or really I should say honored that my son is being featured. You see, the post is about him and his "junk" collections. If you would like to read more, click here. 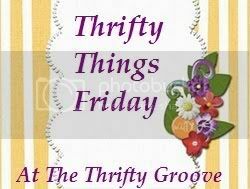 Be sure to go the The Thrifty Grove at check the links at this week's party. Congrats!!! Going over to check it out now!! I read the post on your son and all the stuff he does!!! I am so glad you are so proud! He is adorable!! I also have a 17 year old son, the love of my life. So great to see them growing! He is such an independent and hardworking young man! Thank you, Melanie and Claudine!